The eLife travel grant programme offers up to $1000 to help recipients gain exposure and recognition for their work. In the first round of funding this year eLife Senior Editors have chosen seven applicants to receive travel grants. 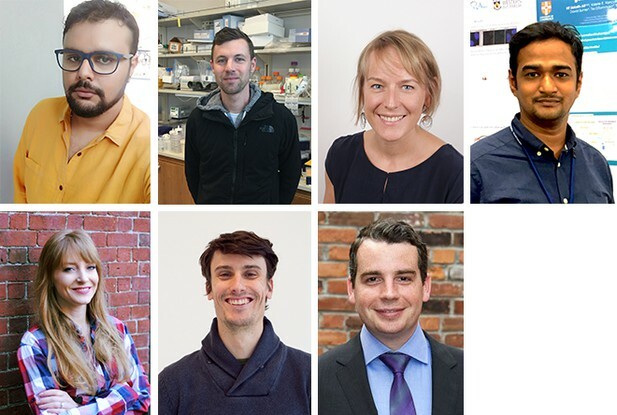 Rittik Deb, Nathan Krah, Inge Kühl, Kif Liakath-Ali, Mackenzie Mathis, Jerome Robert and John Whitney will all be presenting their research at scientific meetings with eLife’s support. In this round we received 30 applications of a very high standard, from across the life sciences disciplines, from basic science to translational research. Shortlisted candidates were judged by Tim Behrens, Hal Dietz, Sean Morrison, Gisela Storz, Diethard Tautz and Huda Zoghbi. Travel grant winners in the first funding round of 2018. Rittik Deb, Nathan Krah, Inge Kühl, Kif Liakath-Ali, Mackenzie Mathis, Jerome Robert and John Whitney have been awarded the first eLife travel grants of 2018. Rittik Deb, of the National Centre for Biological Science (India) was awarded a grant to travel to the 1st AsiaEvo Conference in Shenzen, China, to present his poster on processes shaping gut bacterial communities in natural populations of a predatory insect – dragonfly. Nathan Krah of University of Utah (USA), with the support of the eLife grant travelled to the Keystone Symposium on Gene Control in Development and Disease in Whistler, British Columbia, Canada. There he presented a poster on how cell differentiation determinants can be used to prevent the initiation of pancreatic ductal adenocarcinoma. Inge Kühl from the Centre National de la Recherche Scientifique (France) was awarded a grant to present her study of the mammalian mitochondrial proteome and transcriptome during dysfunction of the oxidative phosphorylation (OXPHOS) system, which is a major cause of human disease and implicated in ageing. She will travel to Lucca in Italy for the Gordon Research Conference on Mitochondria and Chloroplasts, Fundamental Processes in Organelle Biology: Evolution, Biogenesis, Dynamics and Quality Control. Kif Liakath-Ali from Stanford University School of Medicine (USA) will travel to Hamburg, Germany. At the Blankenese Conference on "Translating Translation: From Basic Mechanisms to Molecular Medicine”, he’ll present his discovery of a novel role for the ribosome-rescue machinery in mammalian tissue homeostasis. Mackenzie Mathis of Harvard University (USA), will travel to Berlin, Germany. There, at the FENS Forum of Neuroscience 2018, she will discuss her recent efforts to develop a set of motor adaptation tasks for mice and to explore the neural circuits that are essential for this learning process. Jerome Robert from the University of British Columbia (Canada) was awarded a grant to travel to the Gordon Research Conference on Neurobiology of Brain Disorders in Castelldefels, Spain. He will give a talk on his work on generating the first functional 3-dimensional model of cerebral amyloid angiopathy in bioengineered human vessels, which sheds light on lipid carriers affecting transport of beta-amyloid out of the brain. John Whitney from McMaster University (Canada) will travel to the Gordon Research Conference on Microbial Stress Response in South Hadley, MA, USA, to talk about the discovery and mode of action of protein toxins involved in interbacterial competition. We congratulate all grantees and invite early-career authors on eLife papers to apply for further travel awards available from eLife. The application deadline of the next funding round falls on June 3. Please review the terms and conditions of the program carefully before applying.